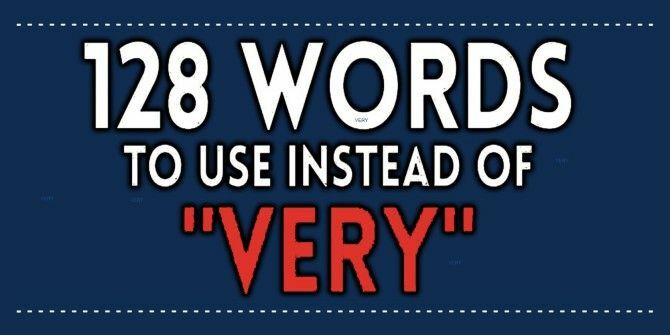 128 Very Good Words That Are Very Capable of Replacing "Very"
I am very excited to share this very interesting infographic with you. It’s very useful because it’ll teach you how to stop using the word “very” so much. I’m very afraid that if you don’t read through it, you’ll make a very big error in your writing by using very weak language. You want your writing to be very visually appealing, and this infographic will make it happen. It’s also very useful for public speaking The Secret to Great Public Speaking According to TED The Secret to Great Public Speaking According to TED Everyone is afraid of public speaking to some degree. The key is to manage that fear and use it to your advantage. Here are some tips that can help you with that. Read More , as you can help keep the people listening to you very entertained. I’m being very serious here, you need to check it out! Its not important as to whether or not the word ' very ' is used. The examples given show an alternative word that can be used regardless of its inclusion. If you cannot use alternatives, please invest in a THESAURUS and attempt to improve your limited vocabulary. For somebody with a weakening vocabulary, this is incredibly useful !! But what if fearful just isn't enough? Perhaps I am very fearful? What would you suggest in place of this? Afraid, perhaps? nice article. will change the manner using the word "very". The title of the article is very misleading. I expected to find replacements for the word very, not replacements for phrases. Very disappointing. How about "very" instead of "super"
Edifying! I once had an editor who banned the use of 'very'! There are subtle differences in meaning between the "very ..." phrases and the synonyms provided. The "very ...." is a more exact term in each case. Sir, I have a request, please tell me the name of the font which you use to write this article. It's looking clean & gorgeous. Capacitive vs. Resistive Touchscreens: What Are the Differences?